Thomas Fabiano has been practicing law for 24 years, the last 20 years as a partner at Fabiano Law Offices. Thomas started out his law career working for a large and aggressive law firm in Chicago defending personal injury lawsuits. During those years of practice, Thomas tried many cases before juries in Chicago, Skokie, Rolling Meadows, and Bridgeview achieving good results. Within a short time of practicing law, Thomas, on several occasions, was asked by the Illinois State Bar Association to speak to lawyers regarding the Supreme Court Rules of Civil Procedure and Trial Strategy. In 1996, Thomas made the decision to return to his hometown of Rockford and he began practicing with his father, Anthony R. Fabiano. This time, however, Thomas chose to concentrate his practice to helping persons who suffered serious personal injuries as the result of another's negligence or wrongful conduct. Shortly after forming Fabiano Law Offices with his father, Thomas and Anthony were joined by another family member, Lisa Fabiano. Lisa practiced with Fabiano Law Offices until 2008 when she became a Circuit Court Judge in Winnebago County. Thomas has tried more than 45 jury trials, including wrongful death cases, closed head injuries, orthopedic injuries, disfigurement cases, ear injuries, injuries from animal attacks, as well as a variety of other injuries. On some occasions, the jury awarded Thomas's client more than what the insurance company offered and even more then what Tom had requested before trial. 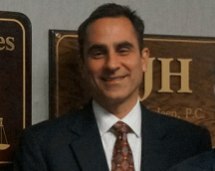 In addition to his trial experience, Thomas has successfully resolved hundreds of cases, including brain injury cases, amputation cases, and death cases as a result of automobile collisions, carbon monoxide poisoning, and structural fires. His deliberate and well prepared approach to handling cases for injured victims has resulted in large corporations changing their safety policies as well as modifying Illinois Law. He frequently serves as local counsel for out of state lawyers and is asked to work on cases with other lawyers. Thomas understands that a person's life and family can be greatly disrupted because of a loved one suffering serious injuries and so he approaches each case as if it is his only case. Thomas has been married to Seema Fabiano, a second grade school teacher, for 18 years and they have four children. When not working, Thomas enjoys spending time with his family, working out, coaching kid’s sports, and reading. He is a member of the Knights of Columbus and serves on the City of Rockford’s Zoning Board.